Lock in a great price for Auberge de la Hulotte – rated 9.7 by recent guests! The family room was so cosy and the bunk bed was out of a fairy tale. The staff were very attentive. The food was outstanding (and breakfast especially yummy). The scenery and the peaceful garden made it a perfect retreat. We had a fantastic family room, which all of us loved. The food was absolutely superb, and the service excellent. We had originally only intended to stay for a one-night stop-over on our family move from Spain to the UK when our car broke down at the Auberge. What could have been a nightmare scenario turned out to be a welcome pause to sample the excellent food the hosts prepared and get to know the area and the hosts' family. The two sisters that run the Auberge and the restaurant could not have been more welcoming and accommodating to our situation. They immediately offered another night's stay in the same room, helped us with organising the car repairs and made sure we had everything we needed whilst our children played with theirs in the beautiful garden. 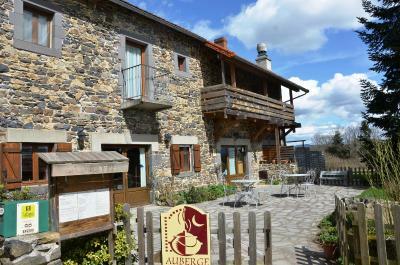 Aside from our specific circumstances, the Auberge and its hosts are 110% worth the detour if you are in the area: perfectly idyllic setting in tranquil surroundings with impressive views; very nicely presented rooms; hospitality second to none and excellent food to go round. Thank you and we hope to be back for a longer stay one day! Located in Saint-Jacques-d’Ambur, Auberge de la Hulotte offers a garden, terrace and on-site restaurant. Vulcania Amusement Park is only 12 mi away and the Puy de Dôme Mountain is 19 mi from the hotel. 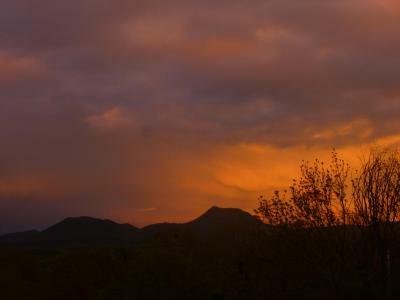 All rooms feature oak furniture, wooden flooring and ironing facilities, while some also have a balcony with views of the mountains or garden. The private bathroom includes a hairdryer. 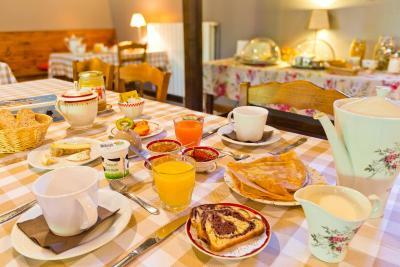 A breakfast serving bread, jam and homemade pancakes is available each morning at Auberge de la Hulotte. Gastronomic and regional cuisine is offered in the restaurant. Hiking and biking routes are found in the area and Clermont-Ferrand is a 45-minute drive from the hotel. Additional features include a library, games, free Wi-Fi access and free private parking on site. This property also has one of the top-rated locations in Saint-Jacques-dʼAmbur! Guests are happier about it compared to other properties in the area. 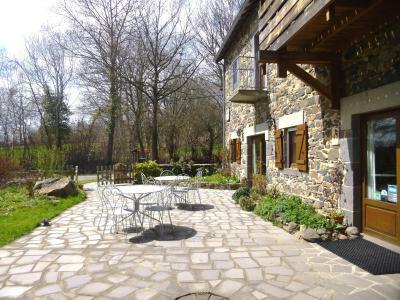 This property is also rated for the best value in Saint-Jacques-dʼAmbur! Guests are getting more for their money when compared to other properties in this city. When would you like to stay at Auberge de la Hulotte? This room features oak furniture, wooden flooring, a wardrobe, desk and tea and coffee making facilities. The private bathroom includes a hairdryer and free toiletries. This room features a balcony with views of the garden, oak furniture, wooden flooring and ironing facilities. The private bathroom includes a hairdryer and free toiletries. House Rules Auberge de la Hulotte takes special requests – add in the next step! Auberge de la Hulotte accepts these cards and reserves the right to temporarily hold an amount prior to arrival. If you plan on arriving after 19:00, please inform the property in advance. Contact detais can be found on the booking confirmation. Please note that reservation is recommended for the restaurant. Please inform Auberge de la Hulotte of your expected arrival time in advance. You can use the Special Requests box when booking, or contact the property directly using the contact details in your confirmation.